I’m always looking for ways to give our students lots of practice in everything we teach them. Most of our students don’t learn effectively by just being presented with skills one way, one day. 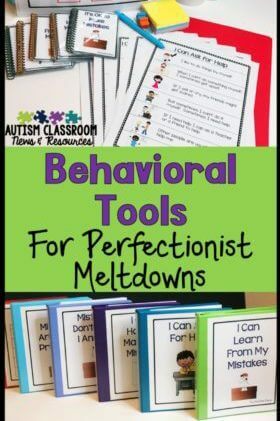 They need to practice skills in a variety of ways in order to maintain them, as well as to generalize them to real-life situations. One way to do that is with BINGO activities built around the skills you are teaching. So at some point or another most of us have thought about or used BINGO in a classroom. But did you know there are ways you can stretch those BINGO cards and skills to get even more learning out of them? I’m sharing 4 ways that you can use any skill-based BINGO activities to enhance students’ learning. 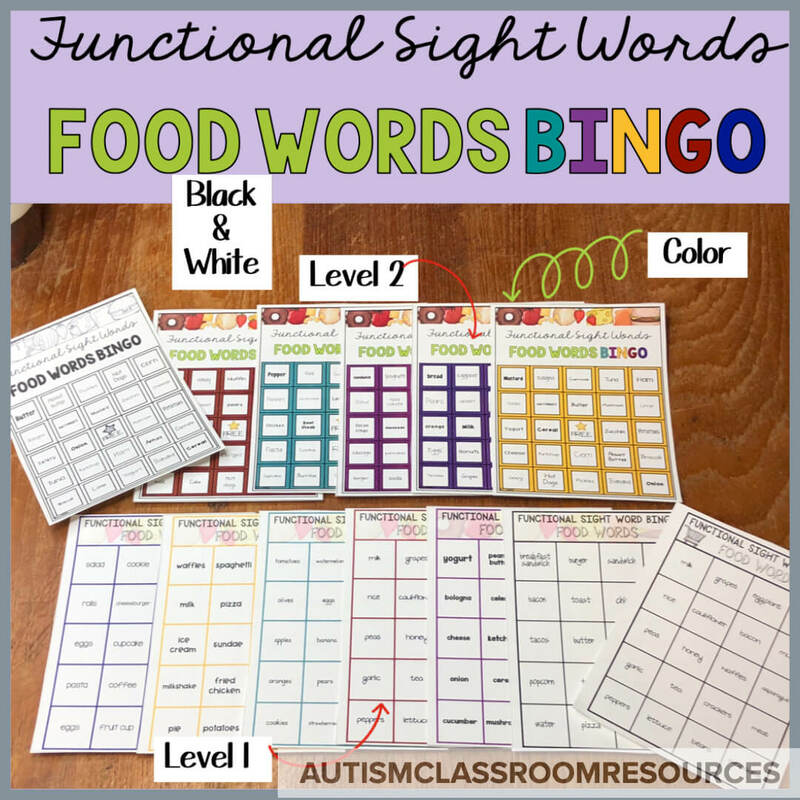 I’m going to use the Functional Sight Word - Food Words BINGO as an example. However, these strategies can be used with any skill-based BINGO activities (i.e., most won’t work well with just regular number BINGO). I know that one seems obvious, but it’s a great small group activity. 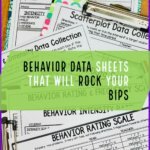 Those of us who have been in special ed for a while have probably created and taught lots of different types of BINGO games. And those newer to the field may wonder why we are obsessed with BINGO. Really it’s pretty simple. It allows students to practice skills in a new way that they think is a game. And, it is a game that even those who struggle with turn taking can play. Let’s face it many of our students are not great at taking turns. And they are still learning how to win and lose gracefully. In fact some of our students we might be working on even wanting to win a game. BINGO allows students to all play at the same time so you don’t have to worry about turn taking. Every student is looking for the items on their card and they don’t have to wait for other students to take a turn. This makes it a great introductory game for many of our students to learn about winning and losing. In addition to playing it as a game, BINGO is great for matching. 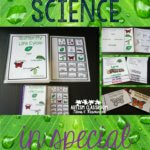 The cards can be used in independent work by making copies of the BINGO card (laminating if desired) and putting Velcro on the words. Then make a copy and cut out the calling cards, laminate and Velcro. Students can then independently match the calling cards to the words on the card in their work system. BINGO doesn’t have to be a whole class or teacher-led activity. One student reads off the calling cards. The other finds the words on the BINGO card. 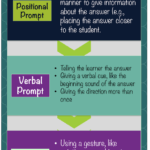 This is great for peer buddy activities or for 2 students in your class who are both working on the same set of words. Then one student gets practice reading the words and the other practices comprehension. And of course you can switch them when they finish the first round so both students practice. One of the best ways to generalize skills to the real environment is to practice them. In the case of food words, that would mean going to the grocery store or restaurant. But we don’t always have the time and money to make purchases there. So here are some fun ways to practice food words in the community (or classroom) without buying a thing. 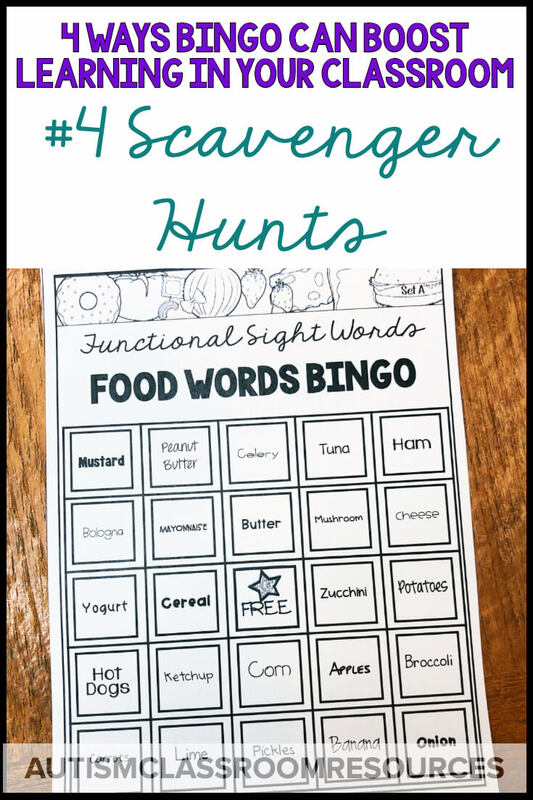 Go to the grocery store and use the BINGO cards to have a scavenger hunt. Students have to find the items that match their card and cross them off using dry erase markers on laminated cards. Use different cards for each student or use the same ones and make it a race. Can’t go to the grocery store? Use a food ad instead. Give the students a bingo card and have them find as many of the words on the card in the grocery ad. You could have them cut them out or just cross them off the card. Or, if you don’t have a food ad, have them use the grocery store online. Many grocery stores now have delivery or pickup or their ads are available online. The students don’t have to order groceries in order to find the items and cross them off their list. Since some of the words would also be found on restaurant menus, you could also gather local menus and have them use them for a scavenger hunt. Another option is to have them use an app like Yelp or online menus to find items where they could eat the words on their card. 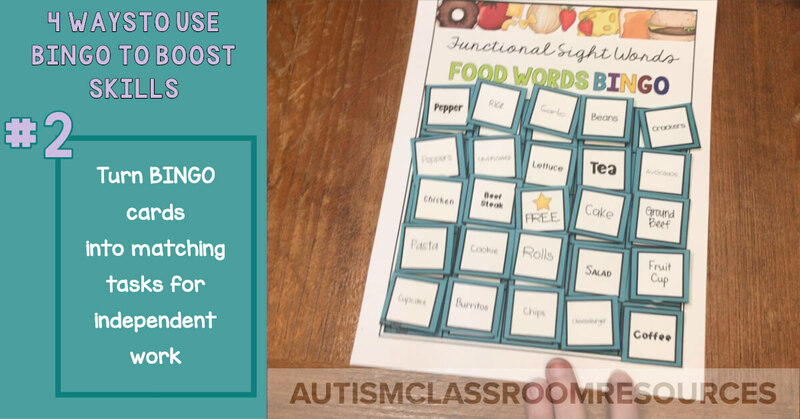 Those are just some of the ways that you can use any type of functional BINGO game in your classroom. 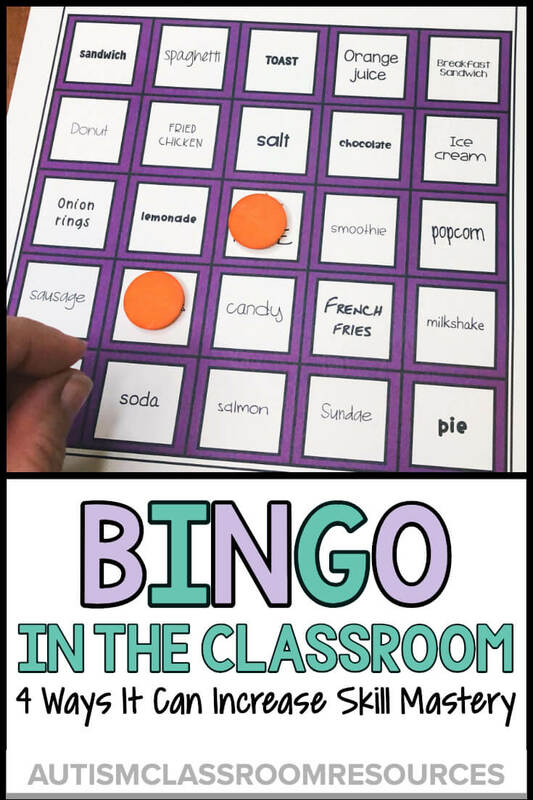 I’d love to hear how you use BINGO in your classroom. Drop me a comment in our Free Facebook Group. If you are interested in Food Word BINGO, you can find it in my store. It has 2 levels to practice the same words you will find in my Food Word Task Cards and the upcoming Food Word worksheets.